In response to the large amount of storm debris from Hurricane Michael, the Florida Forest Service and the University of Florida Jackson County Extension Service will be offering a Certified Pile Burner Course in Marianna, Florida. Normally this course includes a $50 per person registration fee, but the fee has been waived to assist with storm recovery. For the next several months, because of the risk of wildfires and the challenge of private property access, only certified pile burners will be issued commercial permits in the primary impact region of Hurricane Michael. Class size will be limited, so register early. This course will show you how to burn piles legally, safely, and efficiently. This training will be held from 8:30 am till 4:30 pm at the Jackson County Extension Office, 2741 Penn Ave. Marianna, FL 32448. There will be a test at the end of the session. You must receive a grade of 70% or higher on the exam to pass the course. 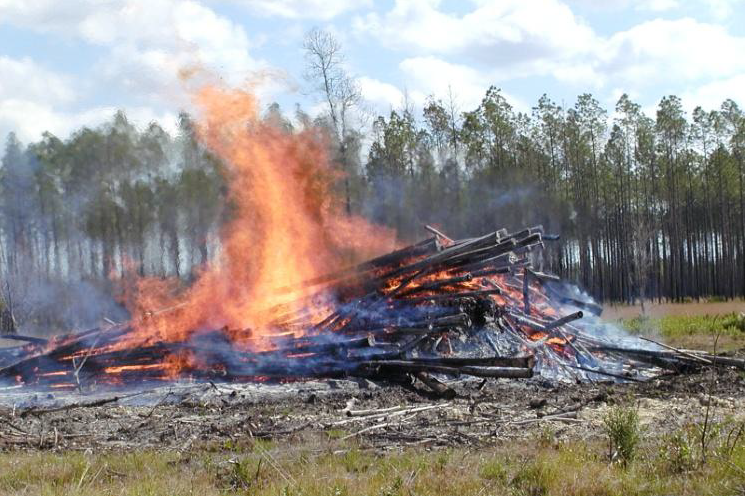 After passing the course, you will need to demonstrate a proper pile burn with approval from your local Florida Forest Service (FFS) office to become certified. Q: Why should I be a certified pile burner? A: Certified pile burners are trained to burn piles legally, safely and efficiently. Most importantly, it could save a life. Also, when the weather is dry, certified pile burners will receive priority for authorization to burn by the Florida Forest Service (FFS). Also, certified pile burners are allowed to burn up to two hours longer per day and get multiple day authorizations. Q: What is a Pile Burner Customer Number? A: When you call the FFS for an authorization to burn, you will be assigned a personal customer number. This number references your information, so it doesn’t need to be gathered each time you call for an authorization. You must have your individual FFS customer number in order to be certified. Q: Is there a test? A: Yes, the test is 20 questions and open-book. You must receive a score of at least 70% to pass. Q: What if I don’t pass? A: Very few people fail the test but if you do, you will be provided another opportunity to take the test at a later date. If you fail the second time, you must re-register and take the training again. Q: Why do you ask for my email on the application form? A: Email is the fastest and most convenient method to inform registrants of their registration status. If no email address is provided, then all correspondence will be sent through the federal mail. This can take several days to relay messages, and this may not be practical if changes are made to the course schedule or for last minute registrations. Q: Is there a cost for the training? A: No. This is a special class in response to Hurricane Michael, the traditional $50 fee has been waived for these courses. Q: How long does my certification last, and how long do I have to complete the certification from the time I finish the class? A: As long as the person with the certification uses their number at least 5 times in a period of 5 years their certification will not expire under the current program. You MUST complete the certification burn within a year of taking the class. Q: Will certified burners be notified if their certification expires? A: Yes, notification will be sent out to them to let them know of their upcoming certification expiration date. Q: Will I be certified at the end of the one-day training? A: No, you will need to follow the written instructions that you will receive from the FFS to become certified. You will need to complete a simple burn plan, have it reviewed and approved locally by the FFS and also have the burn itself reviewed and approved by the FFS. Q: Is there a minimum age to be a certified pile burner? A: Yes, you must be at least 18 years old to take the test and be a certified pile burner.